This Muslim Girl Bakes: Cheesy Chicken Paratha Quesadillas. One of my new favourite recipes! Seriously guys, I'm craving them right now. But maybe that's because I'm fasting as I type this. How's your fasting going? Alhamdulillah, mine is going well. We seem to have really gotten into a Ramadan routine round here with even our bodies only expecting food now at around 9:45pm! Also, I hope you're following me on snapchat (muslimgirlbakes). I share anything and everything over there including lots of recipe video tutorials. We are just over halfway through Ramadan so I think now is the time for all of us to evaluate. To look at what we've done so far and what we want to do more of. For me, my Quran recitation was going well but I wanted to add some commentary and translation to the usual recitation. I've taken to going through this Quran commentary book whenever I can. It really helps bring the Quran to life so I highly recommend you do the same. 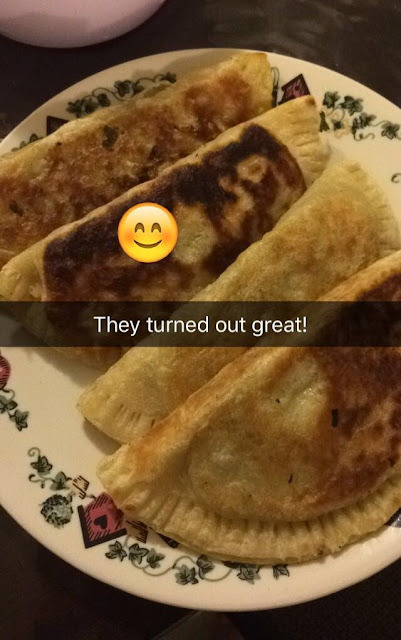 We made these quesadillas on the first day of Ramadan and were basically obsessed with them. There were arguments over who got to eat the last one - the Mother won! <-- obviously. The recipe is so easy. We make a chicken filling with chicken, spices, corn, fresh herbs and lots of cheese. Defrosted frozen parathas are filled with the chicken to make quesadillas which are then cooked until golden and crispy. So good! First up, we are going to want to cook our chicken breast. I boiled mine by bringing a pan of salted water to the boil. In went 1 large Chicken Breast. I cooked the chicken with the lid partly covered for about 20 minutes. Make sure that the chicken is turned over halfway. Then, remove on to a plate. Once it is cool enough to handle, shred or slice up! Meanwhile, take a large saucepan. I used the same one because have we met? I cannot stand extra washing up! Add in 1 tablespoon Butter. .... add in 1 Onion, peeled and diced. Stir in and toss in the butter. Once the onion has softened, add in 1/2 teaspoon Garlic Paste. Along with the ginger and garlic, let's add in the spices. Once the spices are in ..
... add in 2 Green Chillies, diced. Stir everything and cook until fragrant. Next, sweetcorn! You can add any other cooked vegetables at this point too! Throw in about 1/2 tin Sweetcorn. Along with the shredded chicken from earlier. Then, cover and cook on a low heat for 10 minutes. Then, turn the heat off. Stir together and the filling is ready! 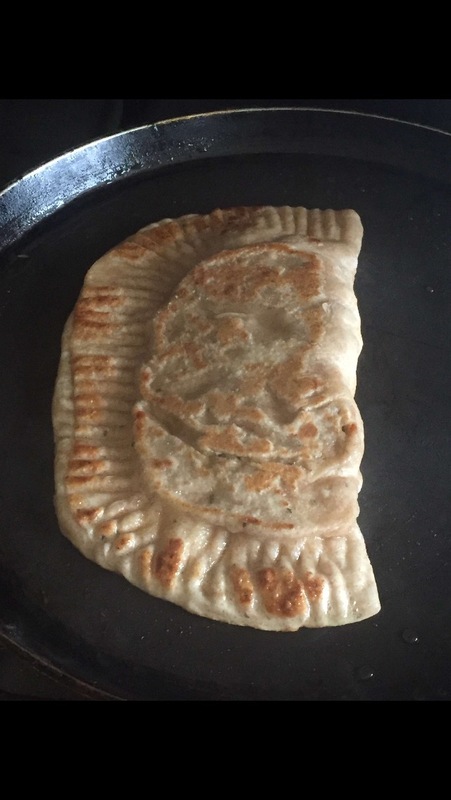 To make the quesadillas, take 12 Frozen Parathas that have been defrosted. For one quesadilla, take 2 parathas. Keep the parathas on their plastic sheets to stop them sticking everywhere. ... place a few tablespoons of the filling. Place the second paratha on top. And, use a fork to crimp and seal the edges. You can also make pasties. Take 1 paratha. Place on a few tablespoons of the filling. Using a fork, crimp and seal the edges. A pastie is done! Continue making all the rest of the quesadillas / pasties. Keep them on their plastic to stop them sticking everywhere. You can also freeze them at this point and cook later. To cook, heat a frying pan or tawa over a medium heat. Drizzle on a little Vegetable Oil. Cook on both sides until crispy and golden. Drain on paper towels and continue cooking the rest. To serve, slice each quesadilla into quarters. Serve immediately with your favourite sauce to dip! Enjoy! To cook the chicken, boil in just enough salted water to cover it – about 20 minutes. Drain, cool and shred the meat. To make the chicken filling, melt the butter in a pan. Add in the diced onion and cook until soft. Then, add in the garlic paste, ginger paste, salt, ground coriander, ground cumin, garam masala and green chillies. Stir and cook until fragrant. Then, add in the sweetcorn and cooked chicken. Stir and cover on a low heat for 10 minutes. Next, uncover the chicken and remove from the heat. Cool completely. Once the chicken is cool, stir in the fresh coriander, spring onions, Cheddar and Mozzarella. To make the paratha quesadillas, take two defrosted parathas. Place a few tablespoons of the chicken filling onto one paratha. Put the other paratha on top and seal the edges using a fork. Continue making the rest – keep them on the plastic sheets to avoid sticking. To cook, heat a frying pan or tawa on a medium heat and drizzle on a little vegetable oil. Cook the quesadilla until golden brown and crispy on both sides. Drain on paper towels and continue cooking the rest. To serve, slice the quesadilla into quarters and serve immediately with your favourite dipping sauce. Enjoy! Keep me in your duas please, and enjoy your quesadillas! Same here! We love the frozen parathas! Your chilli chicken version sounds so good! 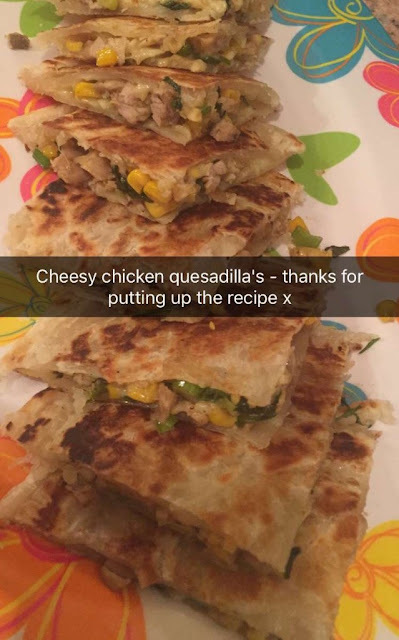 I've made quesadillas with frozen parathas before. But I try not sides up from frozen, then out fillings, then fry again when put together. Your way looks much less hassle with constantly frying. What's the texture like when you only cook one side of the paratha?